The Islamic State (ISIS)'s de facto capital in Syria, Raqqa, has become the new headquarters for global terrorism. It is where plots to sow murder and mayhem across the West are hatched and orchestrated. According to Western intelligence assessments, ISIS planners in Raqqa came up with the idea for the March suicide bombing attacks at the Brussels airport and a metro station, which killed 35 people. 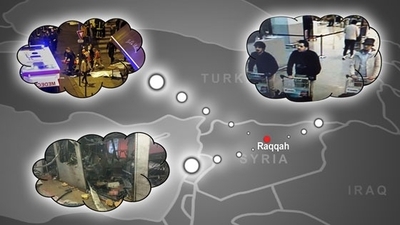 Raqqa is also where the November suicide bombing and gun attacks in Paris, which left 130 people dead, were born. ISIS's caliphate in Syria in Iraq is losing territory to its foes. Yet its home base in Raqqa remains very functional, and it continues to pose a real threat to Western security, as well as to the stability of surrounding Middle East states. Raqqa is where additional mass casualty terrorist attacks are being planned at this very moment. The plots target both Western cities, and capitals of Arab countries ISIS deems as counterfeit Muslim regimes and Western-enabled puppets. Only a sustained military campaign against Raqqa would signify a serious intention by anti-ISIS coalition members to deal with the source of the current waves of terrorism. ISIS has already proven it has a long reach into the West, taking advantage of the porous border with Turkey to smuggle battle-hardened, trained, radicalized European volunteers back into the European cities from which they came. ISIS networks have formed in Syria, and members then stealthily move back into their homes in the European Union, creating sleeper cells that evade the detection of the overwhelmed European security and intelligence agencies. Today, an estimated 3,000 European jihadist volunteers are in Syria. But that could triple by year's end, according to an assessment made public by the French government last month. The concern is that a growing number of radicalized youths could answer ISIS's call to fight for its ranks. This would magnify the threat of organized international terrorism radiating from ISIS-controlled territory by increasing the number of European ISIS volunteers who can return home to form attack cells. Alongside this developing threat is the potential for lone-wolf attacks, which could be launched by radicalized jihadists who were inspired by ISIS ideology online, without ever leaving their European homes. ISIS has achieved its immediate goal of forming a territorial entity, complete with its own brutal internal enforcement apparatus, courts, local administrators, and a largely oil-based economic system that supports its jihadist military. Nevertheless, before all else, ISIS is a concept, and a worldview. It rejects the legitimacy of any state that does not apply the most stringent interpretation of Sharia law. It calls for and plans relentless terrorism against the West, to 'punish' it for the medieval crusades and more recent colonial meddling. ISIS also plots more revolutions in Arab lands, to topple governments and replace them with more copies of itself, which would then, in ISIS's ideal world, join together to form one large caliphate federation. The coming year will probably be decisive in ISIS's future as a semi-state, and by the end of 2016, the world will know whether ISIS will survive in its current form, or if it will lose all of its territory, and revert back to its amorphous, network-based existence. The answer will depend mostly on the determination of the international ISIS-coalition, led by Western powers, to take the fight to the jihadists. The loss of its territory would represent a severe blow, but even in its stateless form, ISIS will be able to continue its siren calls and propaganda recruitment drives to lure in jihadist volunteers, to replace fighters who fell in battle, and mobilize them to act in the Middle East, North Africa, Europe, and beyond. The collapse of Syria, Iraq, Yemen, and Libya as sovereign Arab nation-states, and the potential collapse of additional Arab states, means that ISIS as a movement will continue for years to feed off the vacuum formed in the chaotic Middle East. If ISIS is able to pull off repeat terrorist attacks on European cities in the coming months and years, it is fair to assume that those societies will undergo a transformation, and that the EU government will institute dramatic changes in legislation, tipping the balance away from civil liberties and more towards granting new powers to security forces and intelligence agencies. Those agencies are engaged in an urgent race against time, aimed at identifying ISIS operatives from the flood of real refugees pouring out of Syria. The longer European security forces are unable to tell the ISIS operatives apart from the refugees, the bigger the threat their societies will face. Monitoring and tracking down ISIS-inspired recruits who underwent radicalization without leaving their homes in Europe forms the second key challenge. This entails stealth tracking of social media to create a cyber intelligence picture that can provide timely alerts about those plotting attacks. Intercepting phone calls, emails, and messaging service communications, and anticipating the cross-border movements of ISIS members mobilizing for an attack will also be crucial. Such steps will allow threatened states to know when an ISIS operative in Syria is in touch with a recruit in a Western city, and gain information on emerging plots in time to nip them in the bud. Beefing up border controls, including the introduction of radars and advanced electro-optical sensors on the eastern edge of the European Union, could also occur in the near future. These steps have been proposed in recent months to European governments by some in Israel, including by Elta, a subsidiary of Israel Aerospace Industries. Only a multi-state, interdisciplinary effort – one that has been lacking until now – involving firm offense in Syria, and a tight, coordinated defense on the home front, will help stem the threat. ISIS is not an omnipotent, invulnerable force. Its caliphate is on the retreat, losing ground to multiple foes, and its oil revenues have been cut in half by sustained air strikes on oil facilities. However, ISIS knows how to adjust rapidly to new circumstances, and it will continue to pose an enormous threat to Western security in the absence of a change of course. Yaakov Lappin is the Jerusalem Post's military and national security affairs correspondent, and author of The Virtual Caliphate (Potomac Books), which proposes that jihadis on the internet have established a virtual Islamist state.